Portsmouth have sacked manager Alain Perrin after just eight months. Coach Joe Jordan will take temporary charge of the club, who meet champions Chelsea on Saturday. Chairman Milan Mandaric said: "This has not been an easy decision. Alain is a talented coach and a good man who has worked extremely hard since arriving. "However, the view taken is that recent performances and the general morale amongst the squad needed improvement. We are all extremely grateful to him." Perrin took charge in April and kept the club in the Premiership but they have posted only two wins this season and lie one place above the relegation zone. Following a 3-0 defeat to Liverpool on Saturday, Mandaric was thought to be on the verge of dispensing with Perrin's services but then appeared to have a change of heart. As recently as Wednesday, he announced Perrin would in charge for the "forseeable future" after several senior players apparently spoke out in favour of their manager. However Mandaric told BBC Radio Solent: "The meeting with the players in the week was constructive, but I never said that the meeting was one where the players were giving Alain their full support. "I could also see the supporters body language and their messages everywhere. "All in all, this is something that tears me apart, but it's something that had to be done. Perrin's record of four wins in 20 Premiership games proved his downfall and the 49-year-old has become the first Premiership manager to lose his job this season. Sheffield United boss Neil Warnock and ex-Hearts manager George Burley are in the frame to succeed the Frenchman. In a statement, Mandaric, who has overseen the coming and going of eight managers since he took over in 1999, hinted that he would not look abroad again. Have Portsmouth made the right decision? "I really believe a knowledge of British football is an underestimated asset in a manager and the demand of Premier League football are intense," he said. "We have some wonderfully talented players and the most passionate supporters in the country. "I will now turn my attention to attracting a successful manager to Fratton Park. "I am confident we will find the right man for the job to help Pompey get the season back on track." 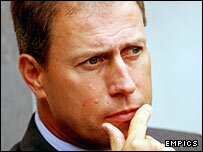 Perrin's departure comes exactly a year to the day since Harry Redknapp resigned as manager, on 24 November 2004.